Soils in the Waituna catchment generally are poorly drained due to the fine sediment (clays and silts) in the soil. This sediment reflects the mudstone, siltstone and claybound gravels that sit beneath. This soil type, along with the low-lying topography, means much of the developed land in the Waituna catchment is likely to include extensive artificial drainage (mole, tile and surface drains). The major soil types found in the Waituna catchment are organic, podzol, gley and brown. The distinct line between Brown soils (upper catchment) and others (lower catchment) clearly shows the shoreline from 70,000 to 130,000 years ago. The key difference in soil characteristics across this boundary is drainage. Brown soils are generally more well drained compared to Organic, Gley and Podzol soils which are all poorly drained and can often become waterlogged. Land development in the Waituna catchment has required artificial drainage. 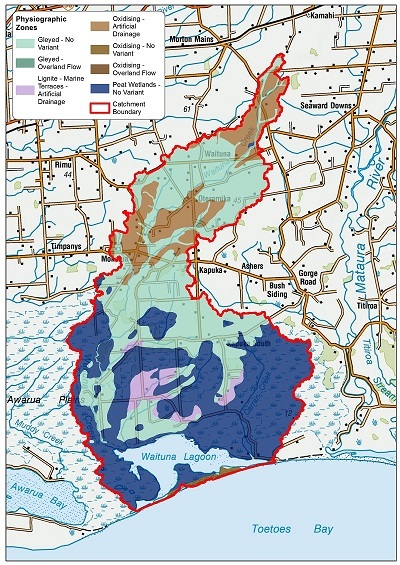 Originally, groundwater and extensive wetland areas (like the Awarua Plains) stored and slowly released excess rainfall to surface waterways, acting like a natural water filter and sponge. With the onset of artificial drainage however and historic clearance of wetland vegetation, water now flows much more rapidly into streams. This reduces summer stream flow, and the opportunity for natural biochemical, or filtering processes to improve water quality. The wetland is fed by a combination of direct rainfall, groundwater and streams passing through the wetland to the coast. These streams drain into the Waituna Lagoon which traps sediment and nutrients. The wetland plays a general role in the recharge and discharge of groundwater, the maintenance of water quality. It is of great importance in supporting aquatic and terrestrial food chains. Environmental monitoring shows that water quality in the lagoon and the creeks that flow into it are under stress because of many years of land development in the catchment and changes in lagoon water levels. As the Waituna lagoon fills with water, the relatively flat nature of the old marine terrace that marks the lower half of the catchment causes drainage water to bank upstream which also waterlogs the surrounding soils. The different soil characteristics between the northern half and southern half of the catchment can result in different environmental impacts for the same landuse activity. Land development in Waituna has included the drainage of wetland areas and the clearance of indigenous vegetation (link to Waituna catchment page). In the 1950’s, the main tributaries to the lagoon were straightened and Government schemes encouraged people to clear and develop the surrounding land. These factors pose the risk of the lagoon becoming eutrophic (murky water dominated by algal slime).